⛅ SUPERIOR QUALITY MATERIAL : Each pair of fun patterned dress socks is crafted with our ultra-soft combed cotton/polyester/spandex blend fabric, and they provide just the right amount of stretch and comfort for your everyday wear. 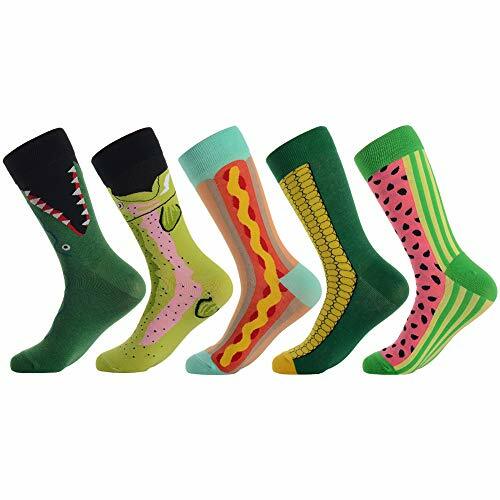 ☔ FASHIONABLE DESIGN AND PERFECT PRACTICALITY:Wear these cool novelty colorful food patterned dress /crew socks and add a pop of color to your everyday clothing.You can wear the fancy funky socks as a pair of casual socks at home, business socks at office, dress socks for a date, groomsmen wedding socks for a wedding or a pair of socks for other occasions. ❄ MACHINE WASHABLE:Machine wash warm with like colors, tumble dry medium. Use only non-chlorine bleach when needed. ⛄ SATISFACTION GUARANTEE :Our ultimate goal is customer satisfaction. In addition to the care for the highest quality products, we make every effort to ensure each client is happy with the shopping experience .If you have any problem with our colorful dress socks,please feel free to contact us and we will give you a refund or a replacement.